Much of the mental imagery we conjure of the non-Western world in the past century come from endless photos–often of varied peoples in fantastic headdress, wrapped in “exotic” clothing and striking regal poses. For artists, creators and those looking for “authenticity” or understandings of cultures and peoples seemingly “lost in time,” these images are invaluable. But how authentic are such glimpses of the past? Especially when constructed through a colonial lens? Can photos…lie? A few weeks back on FB, I posted the link to a Gawker article on the controversy surrounding actor Johnny Depp’s “redface” portrayal of the character Tonto in Disney’s recent adaptation of The Lone Ranger. 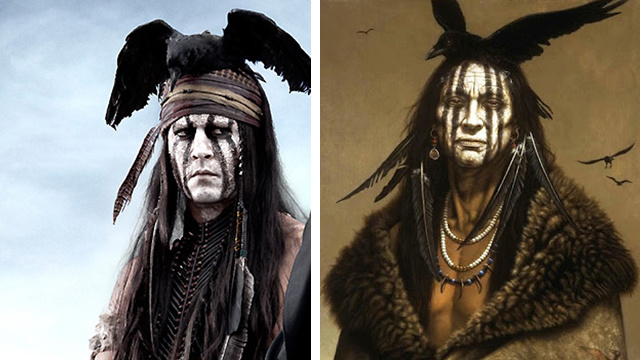 Most noticeably, the article drew attention to Depp’s fantastic interpretation of Native American dress: a figure painted in pale white with a dead crow atop his head. More than a few Native American groups, educators and activists decried the outlandish nature of the character, calling it more “Gothic” than representative of any actual culture. Depp in turn, defended his portrayal as well-researched. The Gawker article revealed that in fact this research evidently included a painting by the artist Kirby Sattler titled, I Am a Crow, which allegedly features a Crow warrior. Beyond the glaring contradiction that Depp’s Tonto isn’t even supposed to be Crow, and is instead described as a “full blood Comanche,” Sattler has freely admitted that his many works of Native Americans were based mostly on his imagination, to “satisfy…[his] audience’s sensibilities of the subject without the constraints of having to adhere to historical accuracy.” This leaves us with a puzzling imagery of a white actor in redface playing the role an imaginary Native American conjured up by the mind of a white artist. So much for authenticity. What happened next however, is what led to this curious blog. A FB debate erupted on both the Gawker article and Depp’s role. One commenter, even pointed to early 20th century black and white photographs of Native Americans in seemingly similar forms of dress. Yet, none of those photos actually looked like Sattler’s imaginative renderings; they may have served as inspiration, but in the end Sattler placed his own unmistakable spin. And it is that “spin” which Depp chose to mimic, not the photos. But there is a secondary issue at work here, and that is whether the photos we glimpse of the past (especially the non-Western past as constructed through a Western lens) can ever be taken at face value. When I started this blog, one of my first posts was titled Orientalist Sketches, in part to explain the artwork I chose for my header and its relationship to my tongue-in-cheek moniker, “The Disgruntled Haradrim.” As I noted at time, the piece is called “The Moorish Warrior,” by William Merritt Chase (1844-1916), part of the Orientalist art movement that pervaded the late 19th and early 20th century Europe. While the painting is stunning, it is also in the end based greatly on the artist’s imagination. In this case, the figure depicted in the image was a model; the scimitar he’s holding belonged to the painter, along with all the assorted props. And it was all staged at a studio in Venice. Much has been written about Orientalist art, its fetishes and its role in the West’s construction of the “other.” So even its admirers are forced to keep in mind that what they are seeing is a fantastic representation that may be far from reality. With photographs however, the matter is more complicated. As a medium, photos allow us to experience history in a way that books and other media cannot. They capture a moment in time for us–tangible, accessible and visible evidence of our past. Their subjects seem to speak to us even in their stillness and silence, like an artifact preserved specifically for our study. The very grittiness of a photo, its black and white imagery, its sepia tones, emotes feelings of authenticity. We see them as “real”–certainly more real than a sketch or painting. Yet they have their own place in the colonial imaginary: products of “staging,” identity and performances of difference. By the late 19th century, photos had begun to replace the sketch and the painting in European magazines and travel narratives, often sent back by Western “explorers” to the metropole to catalog the fantastic peoples they encountered. The rise of photography also coincided with the growing intensity of racial science, which posited that non-Western peoples were inherently and biologically different forms of human beings. It was part and parcel of the Victorian outlook, obsessed with placing humanity into fixed and essentialist categories. This would result in entire photographic books, brimming with photos of “native peoples,” that served the needs of anthropometrics, ethnography and anthropology. 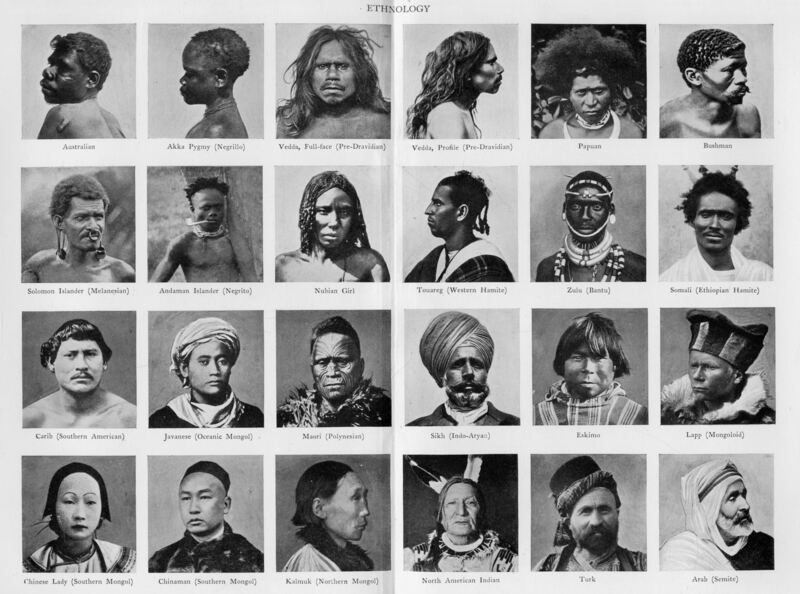 Carl and Frederick Damann’s Ethnological Photographic Gallery of the Various Races of Man in 1876, would introduce the famous “mugshot” images that became the staple in human photographic depiction and was quickly followed by similar works. Toward the end of the 19th century, just as racial ideologues accomodated their thinking to Charles Darwin’s theory of evolution, photography fully took over the reportorial work of painters like [William Holman] Hunt and began to allow great numbers of urban people to “see” Africans living far away. The invention of the half-tone grid-system put photos in newspapers and books in 1888, and began the “10¢ magazine revolution.” Pictures froze images of “primitive” people who were supposed to be disappearing in the path of the very universalizing and homogenizing forces in which viewers were safely enmeshed. David Livingstone’s instructions to his brother, a photographer, transpose William Holman Hunt’s ideas into the incipient scientific language of the day: he asked Charles Livingstone to “secure characteristic specimens of the various tribes … for the purposes of ethnology.” Unlike “exhibitions,” traveling shows, and museums, photography illustrated Africa primarily by means of iconic signs, not indexical ones; like mobile displays, photography transferred “the location of analysis” back to the comfort of the metropole. Photography greatly increased people “in-the-know”: postcards, magazines, white hunter’s books, illustrated travel stories all yielded their messages in urban livingrooms and studies. The trajectory from painting to mechanical reproduction traced the shift from public display to private viewing. Of course, this notion of photographing “others” as a means of categorization was not limited to Africa, and served as a norm throughout the non-Western world. They shared a dubious place alongside the infamous “human zoos,” which put living indigenous peoples on display from varied parts of the globe for the consumption of European and American audiences. Neither were these acts limited to individuals or explorers. Colonial governments commissioned similar photographic panoramas, making them part of the administrative process. The question then arises, what are we actually seeing? When we look at these photos, whose lens are we viewing them through? What gaze was being privileged at the time? How might a photographer shape, direct or even alter a photo’s final outcome? Is the photo of a non-Western person in a headdress realistic? Is it a form of wear worn every day or only for certain events? Why was it chosen to display a person or their particular group? How might a photographer seeking to emphasize difference and exoticism manipulate a photo to fulfill this purpose? 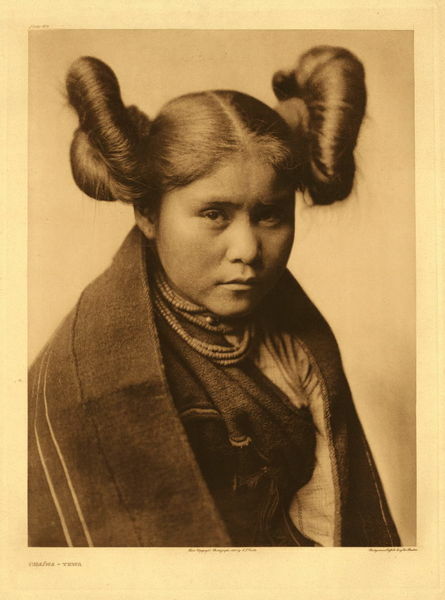 An interesting example can be found in Edward S. Curtis’s, The North American Indian–a collection of photographs of eighty American Indian cultures throughout continental North America. Originally published between 1907 and 1930, the photos were initially financed by John Pierpont Morgan and endorsed by Theodore Roosevelt who wrote a preface for the first volume. The collection of over 2000 sepia-toned images in 20 volumes is remarkable, depicting Native Americans in traditional dress, engaged in varied forms of activities with a distinct sense of realism. They remained so popular during the years, that one can find them dotting numerous websites looking to display the authenticity of indigenous populations. But they are not without their controversies. Namely, that many of them were likely staged. Edward Curtis’s photos were part of an attempt to capture what he saw as a “vanishing race,” and he intended them for the purpose of mass consumption. To that end, they needed to fulfill popular American notions of the “romantic Indian”–including all the stereotypes and nostalgic exotic depictions that were so pervasive at the time. Curtis even went as far as to make certain any modern implements were removed from the photos, in order to portray Native Americans as a static and primitive people untouched by time. In fact the first lie may be that many of these Native American groups he came upon had been decimated by forced migrations and assimilation by US government policies. Many had been forced to cut their hair, remove jewelry and don Western wear. Curtis had them outfitted in traditional ceremonial dress many no longer wore, and engage in staged replicas of the past. In choosing to document a more romantic memory rather than the present, the social political ramifications of the era may have actually been lost. He also directed their poses and retouched images to bring out the effects he desired. So again, what do photos that originate in the colonial past tell us? Are we viewing non-Western peoples as they were? Or are we viewing them as Western photographs stage and construct them? And, for what purpose? There is an opposing factor to take into account–and that is the agency these photographed subjects brought to the staging process. Many colonized peoples quickly came to realize the importance and benefit of photographs. And while colonial ethnologists and photographers may have wanted one thing, many non-Western people may have brought their own agency to bear in controlling how they were to be depicted. 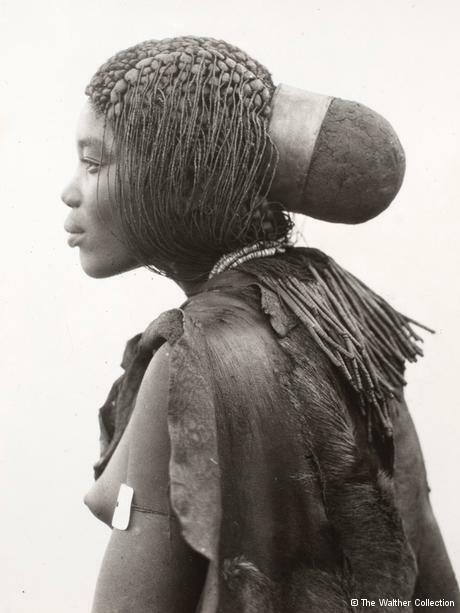 Whether in Africa, Asia or the Americas, non-Western subjects (when able) sought to display themselves in these photos often in positions of power–flaunting their traditional dress, ceremonies or customs. In some cases, they proudly mingled Western dress/items (a military jacket, hat, rifle, etc.) with their traditional dress to display wealth, status and at times an equity with their photographers: a denial of their representation as “static” and unchanging. What does this tell us in the end about these images of the non-Western past? That what we see, or believe we see, is always best placed in a historical context. And it is impossible to gain any form of understanding without also seeing them within a framework of colonial staging, identity and performance. That does not mean they are worthless. Edward S. Curtis’s work on Native Americans remains a valuable resource, alongside stories and interviews he recorded. The various photos from colonial Africa, Asia and elsewhere provide important images of cultures in the midst of change, and offer glimpses into the precolonial world–if only in part. In the end, photos may not lie. Not exactly. But their subjects deserve more than our first glance. This entry was posted in Intellektshul, Speculative Imagery and tagged Africa, colonialism, Ethnography, hybridity, Native Americans, non-Western, Orientalism, Othering, Photography, Race by The Disgruntled Haradrim. Bookmark the permalink. A slightly different angle on this is how perceptions of social groups today depend on photos, especially “fashion”, and how we all seem to be putting ourselves in a group by the way we choose to dress. We’re all a bit like Sam Ofusu. Does that make the fashion industry a form of colonialism? I don’t think so, but there’s always been a status effect, and sometimes that has led to sumptuary laws to protect the high-status clothing style. And we can see some of that in how we are expected to dress for certain kinds of job. Some of the boundaries are blurring, and over the last century some closely-defined styles have almost vanished, or shifted to a new purpose. Are we colonialists now, or have we just always been people?